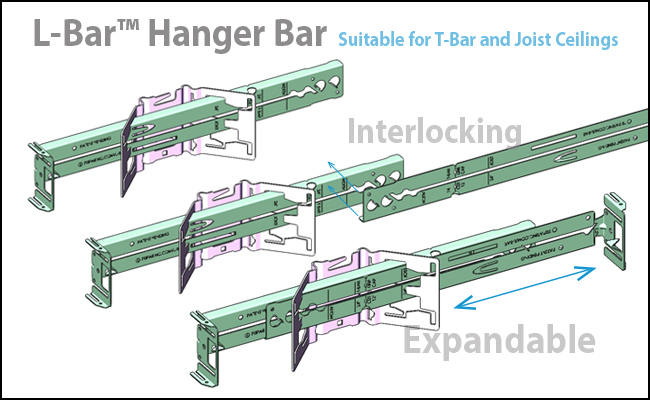 L-Bar is our new, patent-pending, interlocking hanger bar set which is now supplied standard with all recessed Coventry Architectural lighting fixtures. There is no additional charge for these premium hanger bars. Video demonstration is available by clicking here. L-Bars are fabricated from identical L-shaped cross sections that form a sturdy ½” by 1-½” C-channel profile for superior rigidity. Pre-marked with spacing locations for 24” T-bar; 16” and 24” joist ceilings (wood and metal). Extension locks with an easy-to-use integral twist tab. No separate fastener. Interlocking and expandable to 24”. Can be increased to 36” or 48” with the use of additional bars that can be ordered separately. Integral and barbed nail spike for wood joist ceilings. Fits into the C-channel notches on our butterfly mounting bracket. No need to specify hanger bars as a separate line item (unless you need to extend the length to 36” or 48”). Specification sheets for all of our Coventry Architectural recessed products are in the process of being updated. Illustrated features available by clicking here.